How is Gratuitous Tank Battles different to a standard tower defense game? GTB uniquely allows you to play both as the attacker or defender in a battle. 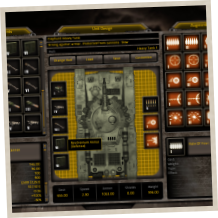 It also allows you to design your own unique units to use in either role, from a wide range of modules for weapons, engines, armor etc. You can save a record of your attacking forces, and then play against them as defender. You can also play against adaptive AI, rather than just a pre-defined script. In addition, GTB has an integrated map editor to let you easily modify existing maps or create your own, plus you can share those maps with other GTB players through the built-in online challenge system. Is GTB a sequel to Gratuitous Space Battles? Sort-of. Certainly not in terms of storyline, but definitely in terms of further developing a new approach to strategy games. Both the games have player-designed units and an online challenge system, but GTB takes the idea a stage further with built-in level editing and being able to change the appearance of units. GTB also has a more comprehensive online ranking system and achievements. The main difference is in the gameplay during battles.Due to popular demand you CAN control your units mid-battle in GTB (to some extent). 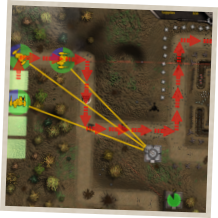 You can issue attack orders and also set preferred routes for attacking units. How do you win a game? Either as attacker, or as defender? This is always difficult to answer. GTB was developed on a quad core Intel i7CPU with 8GB RAM and an ATI HD 5700 Video card, on which it all runs very well at 60FPS fullscreen 1920x1200 res. It very likely runs fine on much lower spec PCs, we have even seen it run fast on a laptop. We will add more information on system specs as the beta-testing period goes on. The minimum screen resolution height is 768, which rules out some netbooks, but they probably do not have the video horsepower to run the game in any case. There are lots of options to turn down the graphics settings within the game. There are a number of different options for sharing your battles with friends, although they are all asynchronous, GTB is not a conventional multiplayer game. You can play a battle as attacker, then post your attack as a 'challenge' to friends, or the whole community, within the game. Gamers downloading that challenge then play as defense against your attacking units. Even if you designed your own customized units, they will also get uploaded and shared. Optionally, you can also post new edited maps along with a challenge. It gets a bit complex here, because when downloading a custom map, players have the freedom to do what they like. 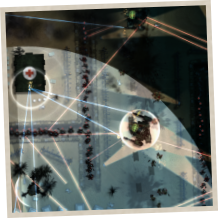 For example They can edit it further, then can play against your attack, they can play a battle against the adaptive AI on your new map, or anything they like. Essentially the challenge system acts as a hassle-free way to share unit designs, battle recordings and custom maps with everyone else who has the game. How easy is it to customise units? Very easy! Every unit that comes with the game is just a sample customised unit. Each unit is made up of a hull, and a bunch of modules. In this respect, it is similar to GSB, although much simpler, as 'augmentations' get applied to an entire unit, which gives many combinations, but much fewer modules than GSB. As well as picking the composition of the unit, you can also change it's appearance. Every unit 'hull' has a number of variations (except infantry), and each variation is split into different layers, which you can adjust the colors of as you please. This means you can have green mechs with bright pink legs, if you so desire, but in practice, you are likely to customise the colors to make it easy to recognise different unit variants you have designed for rapid deployment mid-battle.